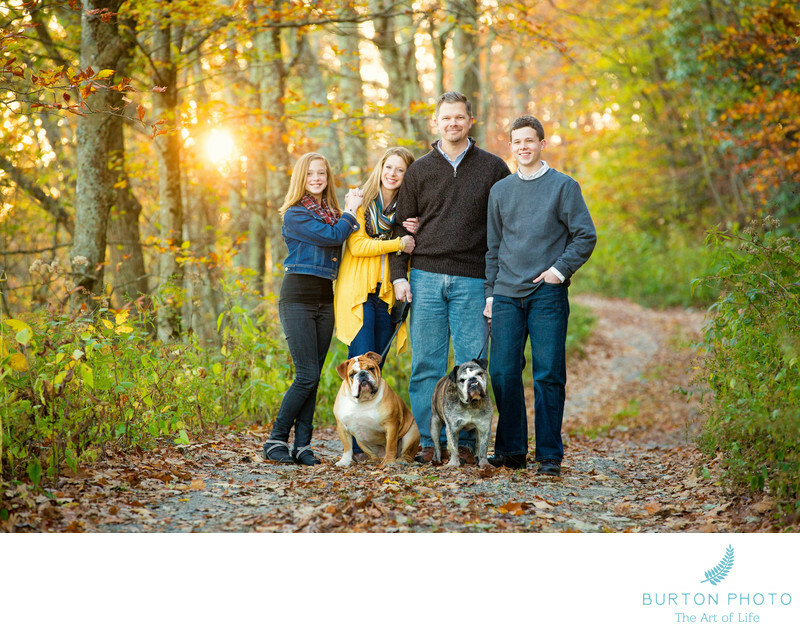 We met this wonderful family in Banner Elk on a gorgeous fall day to create their portrait. The setting sun created warm backlighting as it filtered through the trees. We are always looking for nice leading lines when we compose our portraits and the country lane brings your eye right to the family. Everyone in the portrait is nicely posed, even the two dogs! (We have our secret tricks for having dogs look at the camera…) During a portrait session, we create classic portraits, like this example, as well as more spontaneous, relaxed portraits. Banner Elk is a unique community in the High Country of Northwestern North Carolina. The quaint one-stoplight town is surrounded by spectacular mountain scenery. With an elevation of 3740’, it offers a summer climate that is most similar to New Hampshire. It’s perfect weather for summer or fall portraits with average highs in June-July-August in the upper 70’s. September-October average high temperatures are in the 60's. Summer evenings are pleasantly cool. Winters are very cold and snowy so it’s not surprising that two of the South’s largest ski resorts are located in Banner Elk. Nearby attractions include the Blue Ridge Parkway, Grandfather Mountain, Linville Falls, Linville Caverns, Tweetsie Railroad and Blowing Rock. Banner Elk is within a 2-hour drive from Charlotte and Winston-Salem which makes coming to the mountains for your family portrait session a fun day trip or overnight adventure. With so much to appreciate about Banner Elk, it’s hard to hurry home. When you visit, you’ll soon discover why Banner Elk’s motto is Escape. Unwind. Indulge. We’d love to discuss creating a family portrait for you in one of the prettiest places in the High County! Let’s discuss the possibilities.